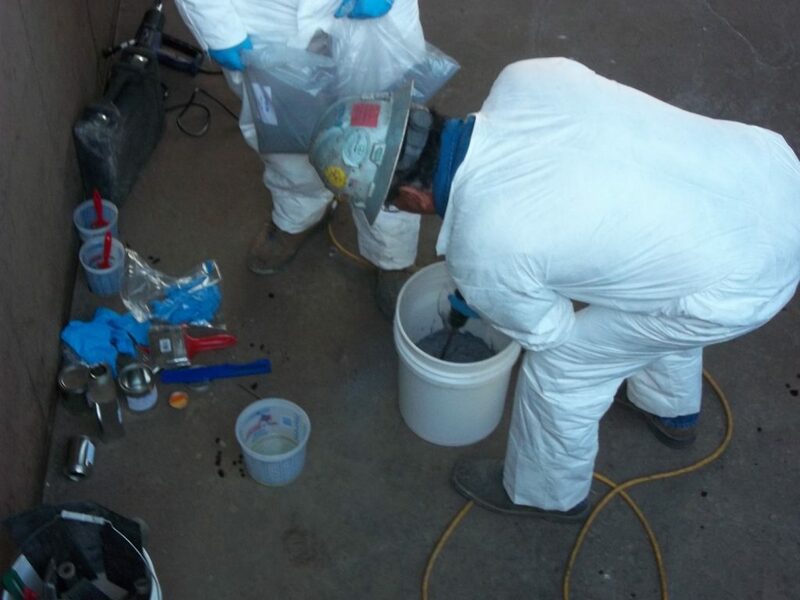 Our team here at PES recently performed a cooling tower repair that was caused by a chemical attack on the concrete structure. We will discuss our process and products we can use to repair chemical attacks on cooling towers. A chemical attack occurred on the concrete structure while the maintenance personnel of this power plant was adding 93% Sulfuric Acid to the water in the cold water basin to aid in the control of water PH. Therefore, we provided the following services and PES coatings to resolve this issue. 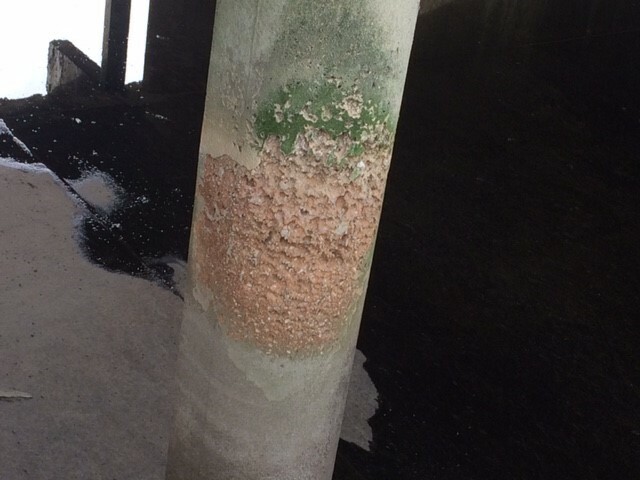 Column surface cleaned by abrasive blasting. Structure was primed with PES-CHEM 505 Damp Seal. 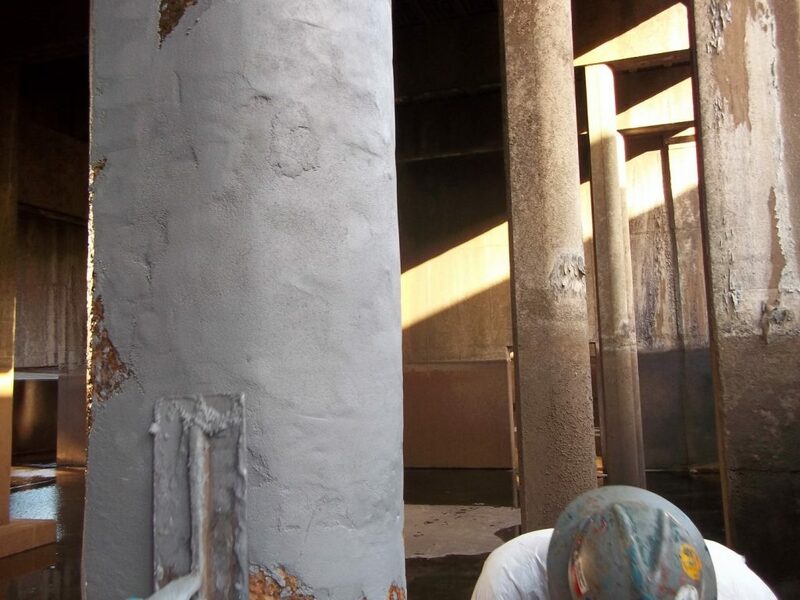 PES prepared the damaged area by abrasive blasting all loosely adhered concrete and opening pores. PES-CHEM 505 Damp Seal is an epoxy resin based, solvent free thin film primer, which is specifically developed for use on green and damp surfaces. 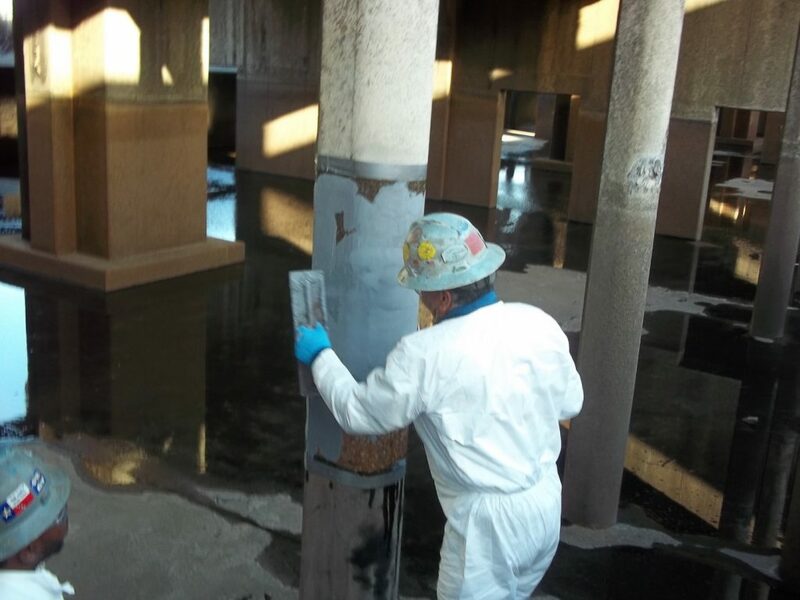 On curing, this product consolidates the substrate which helps to improve adhesion during application of other coating or concrete repair systems. PES-CHEM 574 comes in a 5 or 15 kg kit. The kit consists of 504 primer, resins and specially blended aggregate (505 primer can be ordered as an option). The 5 kg kit will repair 4 sq. ft at ¼ in. and 15 kg kit will repair 12 sq. ft at ¼ in. The materials are mixed in shipping bucket. 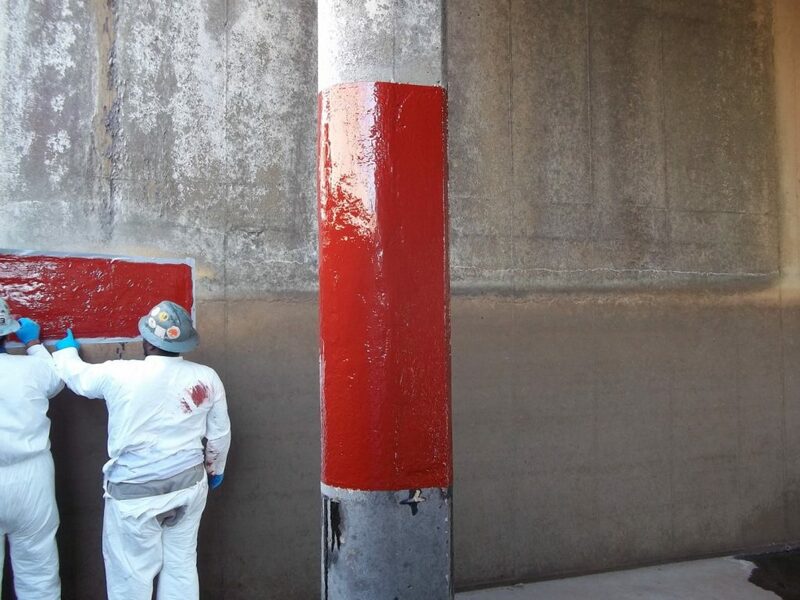 PES-CHEM 574 allows for easy application to a vertical surface at thickness of ¾ in. After 30-40 minutes at 68°F and before 6 hours have passed, you can add additional layers of PES-CHEM 574 without any additional surface prep. Material will require sanding and re-priming. We can use PES-CHEM 574 to top coat for more chemical protection within 30-45 minutes at 68°F and before 6 hours have passed. 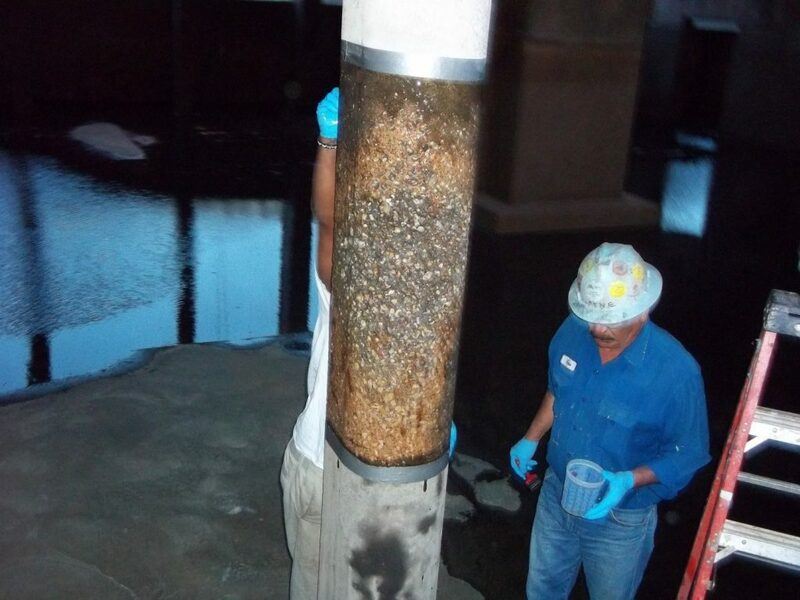 Power plant was adding 93% sulfuric acid to cooling tower water to balance out PH, so we provided application of PES-CHEM 511 UCEN to protect this area where there are additional chemicals. 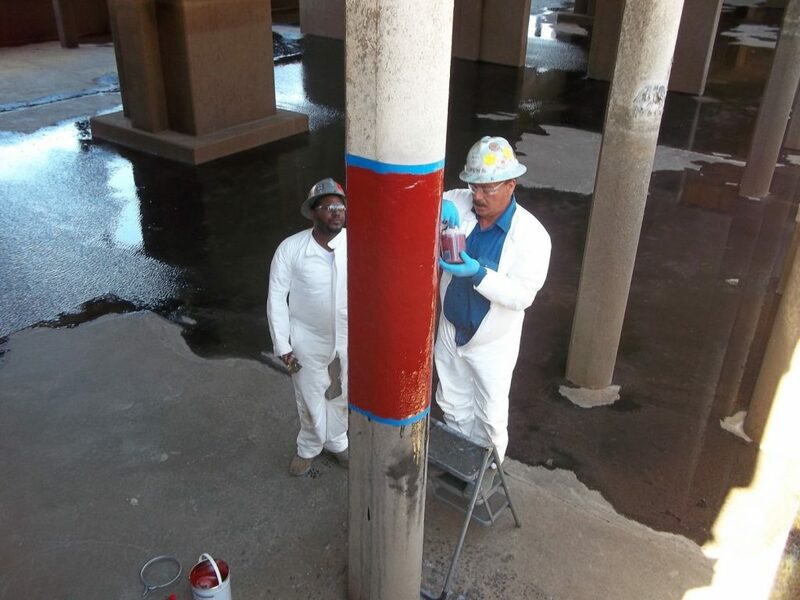 We can easily apply PES-CHEM 511 UCEN at a thickness of 20 mils with a brush or roller. We can also spray 40 mils in a single coat. Here at PES, we design our products to offer repair and protection solutions to many industrial maintenance problems, including cooling towers. Contact us with the link below for more information on our products! This entry was posted in Cooling Towers and tagged Cooling Towers, PES-CHEM 505 Damp Seal, PES-Chem 511 UCEN, PES-CHEM 574. Bookmark the permalink.